Todd “Horny” Hornbuckle and his 7-year-old daughter Madelynn need our help, our prayers, and our uplifting support. I’m sure all of you that know him are in complete shock now finding out Todd was in an aircraft accident on October 1st. His reputation as a top pilot is widely known and supported by his accumulation of multiple aviation medals and citations over his military career. Please ignore the inaccurate news reports. Here is the truth. 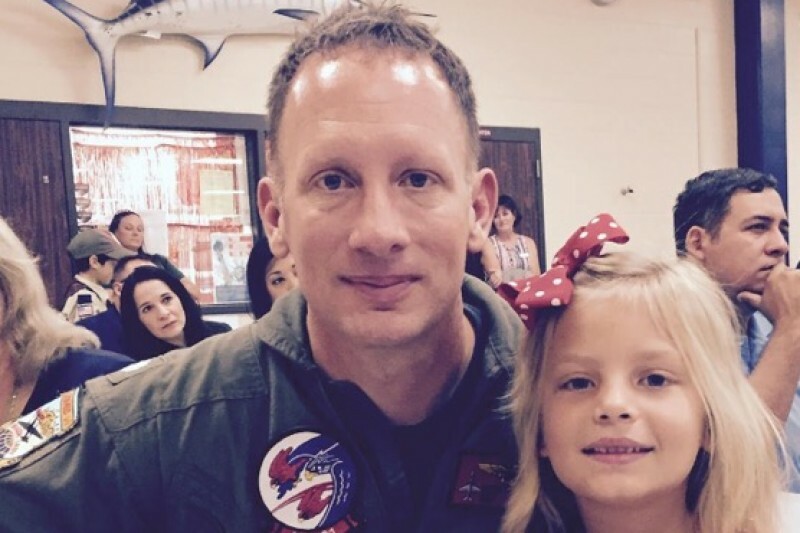 Todd and Madelynn were flying to Taylor, TX, when his engine quit on final approach. We are told that there was only one small opening in the tree line and that’s where Horny put his plane, right between two tree trunks ripping the wings off but sparing the fuselage, something only a handful of pilots could have done, saving his life but most importantly, his 7-year old daughter Madeline’s. In the hospital when Madelynn awoke, she recalled that her “Daddy saved me. He told me to make sure my seat belt was on calmly.” After they crashed she explained, “Daddy covered me while he was on fire” and shielded her from the flames and heat. She then recalled how her Daddy pulled her from the plane and then jumped into a nearby swamp (we assume to put the flames out and possibly saving his own life). When the friend Todd was flying to see saw the smoke and finally found them, he said Todd was severely burned and visibly in horrible pain. He discovered Todd had carried his daughter, somehow even though badly burned, nearly a quarter mile and over a farmers fence to find help for Madelynn. Todd eventually passed out from the pain after the paramedics arrived and once he knew Madelynn was receiving medical care. We could list all of Todd’s accomplishments in his life so far, be it his his love for his family and friends, his incredibly distinguished military career, or now being a hero to us because he saved his baby girl Madelynn and he is forever her “Hero Daddy.” And when Todd finally wakes he'll know Madelynn is still alive, extremely brave, and will fully recover, nothing he’s ever done in his life will ever give him more fulfillment than that. We are asking that you show Todd how much he means to each of us by taking some financial stress off his wife and family by giving what you can so they can concentrate on giving Todd and his daughter Madelynn the love and support they both need to recover from their injuries. Even a few dollars goes a long way. We want maintain Todd and Madelynn’s privacy however we feel it is important to let everyone know the extent of their injuries and why we are asking for donations. Although they have medical coverage with the military currently, that doesn’t cover all of the costs associated with caring for them. Todd is currently in a San Antonio Medical Center that specializes in burn care. Todd sustained severe burns to over 50% of his body (mostly his left side from protecting Madelynn), in an induced coma for an undetermined time, and undergoing several surgeries in the next few days. He is expected to be in the ICU for another 6 months with an undetermined amount of time for rehabilitation. Madelynn has now been transferred from Austin to San Antonio so the family can visit with both of them. Her injuries are far less severe then her Dad’s, although she has some minor burns and bruising. She is awake, and in good spirits, but clearly concerned about her Daddy. The Hornbuckle’s live in Corpus Christi and Tamara, his wife, will have to balance caring for all of her family at first, and then just Todd once Madelynn goes home, and all from several hours away from their Corpus home. Tamara has a job and may have to quit to care for Todd during his long rehabilitation. The lodging, food on the road, gas, etc. will start to add up quickly, especially if she quits her job. A little bit of financial relief would be extremely helpful for Tamara as she figures out how to provide care for her whole family. Please help spread the word and let’s overwhelm the Hornbuckle’s with love and support! This update is by far the best update I’ve been able to give. Todd is not only out of the ICU, but also out of the hospital completely. The word miraculous is usually what I begin with when describing his current condition to those who’ve asked me about it. To be clear, he is still undergoing treatment for his injuries at the hospital daily. The medical staff did feel that he progressed enough for him to move into the Fischer house nearby the hospital where he can walk daily (yes I said walk) for his treatment. I had another opportunity to visit with him recently and he was far more coherent and alert than my first visit to the ICU. His injuries we visibly better and his spirits were high. My friend was finally back…cracking jokes, inhaling Salisbury Steaks, and enjoying cherry limeades. That was so wonderful to see. He related to me how thankful he was for all of the support he and his family have been given and how touched he was by the outreach of so many on his behalf. Of course, he still has a long way to go with treating his injuries and his daily rehabilitation exercises but to say he has come a long way in a short time would be an major understatement. Keep the prayers and positive thoughts coming though and know that they are indeed helping him heal. This will be my last update on this site. I think rather soon you’ll all be able to reach out to Todd directly and he can tell you in his own words just how great he’s doing! When I visited Todd last week the nursing staff told me that Todd had set a new hospital record by sitting up on his bed unassisted for 17 minutes. They seemed to be surprised by his ability to do this, but if you know Todd at all, you know he’s a competitor and excels at raising the bar. That was last week. True to form, Todd is continuing to push himself during his recovery and exceeding expectations. Tamara just told me that he has been moved out of the ICU even though last I was there the medical staff thought it would be a few more weeks. Even more incredible is that he is up and walking, on his own, to his physical therapy sessions. He is rehabbing on an elliptical for five-minute sessions along with pulley exercises to strengthen his arms. As you can imagine the therapy is tiring but he refused the wheelchair afterwards and walked back to his room. And he has also been cleared to have his juice again which for him I bet is the greatest development because he was pretty discouraged last week when they took that away from him. In short, Todd has made monumental progress in just one week. The prayers and well wishes are undoubtedly helping him and the family so please keep them coming. He still has a long way to go, and another surgery planned for this coming week, but the progress he is making is encouraging and inspiring. I first wanted to thank every one of you that have shown an overwhelming amount of support for Todd, Madelynn, and his family. Chad and I had the opportunity visit Todd yesterday and Tamara told us how uplifting, helpful, and comforting the goodwill, support, and prayers have been to all of them. It has helped lift their spirits through this most difficult time and there are truly no words that could possibly begin to convey how thankful they all are. Chad and I had the opportunity to visit with Horny yesterday and although we wish it were under different circumstances, it was great to see him. Horny had us laughing in the first few minutes we were there. He wasn’t to “happy about the shoes” they had on him but the rest of his outfit was ok.
All things considered, he’s in good spirits and he’s an incredible fighter. He is awake, although sedated for the pain, and able to speak briefly. Amazingly, they had him up that morning to take a quick tour of the facility. The nurses we spoke with are encouraged by his progress. That being said, he still likely has multiple surgeries remaining to treat his burn injuries. He’s showing his true grit by already trying to work on his rehabilitation exercises even though his movement is very restricted. It would still be premature and irresponsible of me to make any kind of prediction about his condition or how long he will be in the ICU. Simply stated, his condition is quite dynamic, and the medical staff is concerned about infections and other possible complications, but they are optimistic about his recovery and that’s all a fighter like Horny needs. We told him about the swift and powerful show of support for him from all of you and we know he was deeply moved, even if he couldn’t say it, by what all of you have done for him and his family. Todd continues to remain sedated and he has made it through his third surgery. He is doing as well as could be hoped given the severity of his injuries. The biggest prayer request is against the spread of infection. Madelynn’s injuries are progressing well and she should be discharged from the hospital within the next few days. We will update again in a few days and we just ask for continued prayers. God is at work right now and we are witnessing his grace and blessing on a daily basis. Thank you all! Thank you for supporting our dad. Todd's Dad and Jeanie want to thank each and everyone who has reached out in this difficult time. God Bless all. The gratitude for all the support shown for my son His family can not be expressed in words. Thank you God bless you. Yours prayers continue to sustain him. Praying for you, Madeline and your whole family, Todd! Godspeed! This is amazing news. I have been blessed seeing what God has accomplished and my prayers will continue for healing in every way and that God will bring incredible blessing from this trauma as only He can! You are a true hero to us who have never met you personally, but who were drawn to give help in a time when you needed it. You gave everything to save and protect your little girl and are a man to be proud of and we hope the very best outcome. So happy to learn of more healing! Continued prayers and best wishes. So thankful he is doing better. God is good. But I'm sad you won't be doing any more updates. I enjoyed reading about his progress. A truly uplifting story. Thoughts and prayers to continue. Thank you for this last update on Todd. I was hoping he was improving. I was just sharing his story this last weekend with people that had either lived in Douglas or were gone and did not know about what happened. Hi Todd, I am Edna, Aunt Dorothy's daughter and you might remember Justin and Leslie our children, when you guys lived in Glenrock and they visited grandma Dorothy . We just wanted you to know we are praying everyday for you to recover! We love you and lots of prayers coming your way. We continue to think of you Todd, Tamara & Madelynn. May every day be strengthening and that your healing be accelerated and uncomplicated. Love & prayers coming your way. Thank you for posting these updates, Justin. I'm praying for you all. God Bless you. Prayers are with you and your family for a speedy and full recovery Todd. Horny! We love you brother. Get well amigo. I know there is nothing I can say that will make the healing process easier. May the love of family and friends comfort you during this difficult time.